Bridge Point Riverbend is one of Bridge Development's finished projects at 2201 W. Broward Blvd. in Fort Lauderdale. South Florida industrial real estate isn’t seeing just a steady uptick of institutional investment, now it’s a flat-out surge with institutional buyers accounting for nearly half of the transaction dollars. “It’s accelerated over the last three years as the demand for industrial space has grown,” said Alex Zylberglait, senior managing director for investments at Marcus & Millichap in Miami. Institutional investors accounted for 42% of the $2.2 billion worth of industrial purchases in 2018, up from 28% the year before on $1.8 billion in purchases, according to Avison Young data. In dollars, the institutional money nearly doubled — from $499 million to $930 million. They are betting future returns based on the market’s strength and perhaps the region’s healthiest segment. 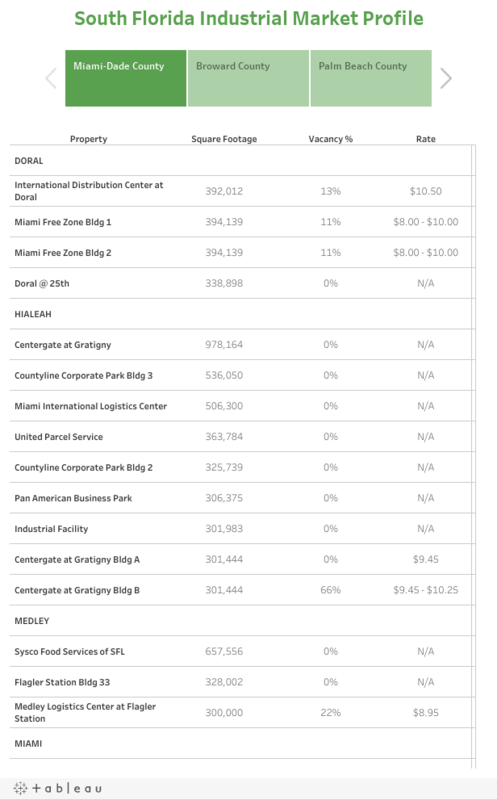 And they aren’t the only deep-pocketed investors in South Florida. Real estate investment trusts bought $310 million worth of industrial properties last year, the Avison Young data shows. While that’s slightly less than their 2017 spending of $321 million, for proof of the REIT appetite look no farther than individual transactions. In a region where headline-grabbing trades across asset classes abound, REITs and institutional investors have netted some whoppers. In the biggest deal of 2018, Duke Realty Corp., a REIT based in Indianapolis, bought four fully leased buildings at Countyline Corporate Park in Hialeah for more than $200 million. Supply chain manager Flagler Global Logistics is developing the park with nine buildings northwest of Northwest 154th Street and 97th Avenue. Like institutional investors and other REITs, Duke made the mammoth purchase because of the enticing market conditions. “We are expanding our investments in these areas because of the dynamics of population growth and income growth, the difficulty of finding development sites in these areas. We expect the properties to remain highly occupied and rents to grow above national averages,” said Chris Brown, senior vice president for Duke Realty’s Southeast region. Unlike most institutional investors but like other REITs, Duke plans long-term holds. It has more than 7.7 million square feet of industrial property in South Florida. “We are looking for well-located industrial assets where we think rents can grow over time and we can increase our return from the initial investment,” said Brown, who is based in Atlanta. Institutional investor Harbor Group International LLC, based in Norfolk, Virginia, made its first investment in South Florida industrial space in 2018 when it bought the more than 158,000-square-foot headquarters of equipment supplier Power Systems Manufacturing at 1440 W. Indiantown Road in Jupiter for $40.8 million. This breaks down to $257 per square foot, the top per-square-foot purchase price in 2018 in South Florida, according to Avison Young. The price was driven by the combination industrial and office space fully leased by PSM under a long-term contract, said Richard Litton, president of Harbor Group. South Florida vacancy rates are extremely low and pushing up lease rates. By year’s end, the vacancy rate is expected to decrease to 3.8% in Miami-Dade County, hover at about 3.7% in Broward County and dip to 2.9% in Palm Beach County, which is one of the tightest industrial markets in the U.S., according to Marcus & Millichap data. It’s thanks to a favorable tip in the demand-supply scale. There’s voracious appetite stemming from the growth of e-commerce, population growth and the region being a popular crossroad for Latin American trade. The supply can’t keep up because available land near seaports, airports, freight stops and interstates is limited. Another issue is height. The tight market attracting outside investors has been bad news for smaller players who can’t compete with their well-heeled counterparts, said Dominic Montazemi, managing director at Cushman & Wakefield in Boca Raton. “I think the private capital investors are sort of taking the crumbs when they can where the institutions are just not showing up,” he said. Institutions and REITs are focusing on top-tier assets, which tend to be bigger, more expensive and more tech-driven than older buildings. “I would say plus-or-minus $10 million to $15 million range you start to get kind of small for an institution unless there is some economies of scale for them, if they already own in the market, if it’s an opportunity to assemble,” Montazemi said. In competing for those deals, the big players have a leg up because their cost of capital is cheaper in the eyes of lenders. But it’s not like smaller investors face no competition from institutions and REITs for mid-tier assets. Demand from the bigger players has tricked down to Class B, value-add product with potential to build occupancy and cash flow from renovations, Benton said. Take for example Deerfield Beach’s Powerline Business Park, which sits on 26.4 acres. It has 24 small-bay buildings, which is smaller than usual, and was completed in 1994. Neither feature normally is attractive to institutional buyers. But San Francisco-based institutional investor Stockbridge Capital Group bought it this year for $62.3 million. “The scale of it, the location and the opportunity for that institution to add value” explains why Stockbride picked up the property even though it’s not best in class, Montazemi said. The industrial park is 443,720 square feet, meaning that even though individual units are small the total itself is large. “In this case, an institution bought what otherwise would have been more of a private capital quality piece of real estate because they do have so much capital and it’s hard to find opportunities down here,” said Montazemi, who was part of the Cushman & Wakefield team that closed the trade. Institutions and REITs aren’t restricting their appetite to existing assets. They are getting into the development game as well. Nearly 6.7 million square feet of industrial real estate is under construction in South Florida: 3.8 million in Miami-Dade, 2.2 million in Broward and 582,800 in Palm Beach, according to CoStar Group data from mid-March. Institutions and REITs are building some of it on their own. San Francisco-based REIT Prologis Inc. is developing the Beacon Lakes business park, which will have 4.6 million square feet of industrial space plus 495,000 square feet of retail on 478 acres northwest of the Dolphin Expressway and Florida’s Turnpike, according to the company’s website. About 2.1 million square feet of Class A warehouses has been finished. “South Florida reflects the demand for space. It is one of our key global markets and services a growing local population in addition to operating as a true gateway to trade in Latin America and the Caribbean,” said Scott Gregory, a Prologis vice president and South Florida market officer. Overall, the company has more than 140 distribution facilities totaling 17 million square feet including big names tenants such as Amazon and Switzerland-based travel retailer Dufry, Gregory said. Pent-up demand has been good news for so-called merchant developers, and Bridge Development Partners LLC has been a prolific builder. Some merchant developers have been pursuing package deals with institutions to develop and sell the finished product, said Cushman & Wakefield’s Montazemi. Bridge is developing the 1.1 million square foot Bridge Point Commerce Center on 185 acres southwest of Florida’s Turnpike Extension and Northwest 47th Avenue in Miami Gardens for delivery in the second quarter. A fourth building will bring the total size to 2.1 million square feet. Bridge recognized South Florida’s potential early on, Montazemi said. “I want to say it was back in 2010, 2011 when they really started trying to figure it out. They were really one of the first groups to get in and created a momentum for themselves that continues today,” he said, adding most of the new buildings will end up in the hands of major investors. Ultimately, expect them to stay dominant in South Florida’s industrial market.